Bursting with more power, refined design and increased efficiency, the new Porsche 911 range has arrived at in India showcasing cutting-edge technological advancements in what is the most highly evolved 911 to date. The Carrera models feature a completely new engine generation with bi-turbo charging, which set the benchmark in terms of performance, driving pleasure and efficiency. Across the range, a gain of 20 hp has been achieved, despite a fuel reduction of up to 1.0 litre per 100 km. The new 911 Carrera produces 370 hp, whilst the 911 Carrera S delivers 420 hp, thanks to a combination of turbochargers with modified compressors, enhanced exhaust system and tuned engine management. Torque gains in the new models are also significantly improved by 60 Nm, with 450 Nm in the 911 Carrera and 500 Nm in the 911 Carrera S. Drivers will also now benefit from the full torque being available to be converted into sprinting power from as low as 1,700 rpm. The maximum torque is available over the entire range at up to 5,000 rpm. Rear-axle steering, which for the first time is available as an option for the Carrera S models, considerably increases the overall dynamics of the vehicle. Taken from the 911 Turbo and 911 GT3, stability is noticeably increased when the front and rear wheels are turned in the same direction starting at a speed of 80 km/h. At speeds of up to 50 km/h, the wheels are turned counter to one another for improved agility. This technology also enables better manoeuvrability in city traffic thanks to the vehicle’s turning circle being reduced by 0.4 metres. Meanwhile, the 911 Turbo S develops 580 hp thanks to new turbochargers with larger compressors. It is also the first production 911 to accelerate to 100 km/h in less than three seconds, reaching the milestone speed in 2.9 seconds. The model’s top speed is 330 km/h, 12 km/h higher than its predecessor. The breath-taking figures are a result of Porsche still being the only manufacturer to employ turbochargers with variable turbine geometry in a petrol engine. Sure to excite Porsche enthusiasts are the refined exterior features of the new 911 models, which further enhance its iconic character. They include new headlights with four-point daytime running lights and a redesigned rear lid with vertical louvres, as well as distinctive four-point brake lights. In conjunction with the optional Sport Chrono Package and for the first time, all 911 models now have a mode switch on the steering wheel. Derived from the 918 Spyder, mode switch consists of a rotary ring with four positions for the driving modes “Normal”, “Sport”, “Sport Plus” and “Individual”. Depending on the equipment, the latter setting enables drivers to configure their own individual vehicle set-up. In combination with the PDK transmission, the mode switch has an additional push button, the “Sport Response Button”. When this button is pressed, the drivetrain is pre-conditioned for maximum acceleration for 20 seconds, a feature that can be deployed for overtaking manoeuvres. Meanwhile, the interior of the new models has been updated with the enhanced Porsche Communication Management (PCM) system, featuring a multi-touch seven-inch display, which offers a considerably expanded range of functions and intuitive controls similar to operating a smartphone. 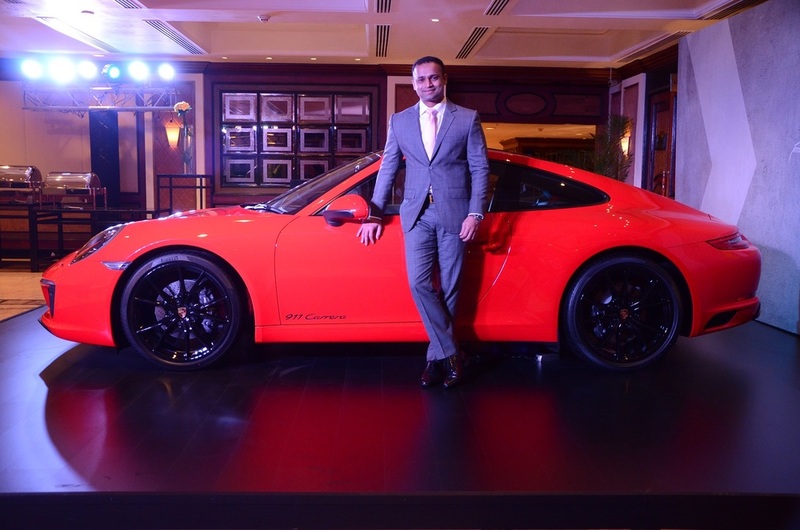 The new Porsche 911 is now available for order in India. The basic retail price ex-showroom for the standard 911 Carrera base model starts at INR 14,233,000 in Delhi and INR 13,971,000 in Maharashtra.